Request a Quote Now and receive a response within one business day! 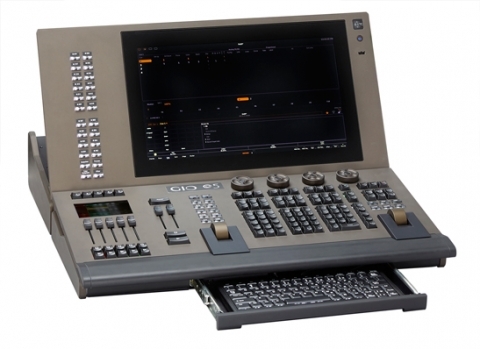 Gio @5 brings the high-end control of the larger Eos family consoles to venues with tighter spaces – or tighter budgets. This portable console packs all the control necessities into a compact footprint, so external monitors and accessories are optional. The console features the same full-function, backlit keyboard as the Eos Programming Wing and Gio console, providing an easy transition for experienced Eos users looking for a smaller desk – and a good platform for new programmers looking to gain professional skills that scale up. We strive to provide impeccably maintained equipment that is prepped and ready for your next event. Our experienced staff stands ready to help you create the perfect lighting and video experience. You will receive a rental quote back within 1 business day. Thinking of purchasing rather than renting? UsedLighting.com is a division of 4Wall Entertainment that provides a safe place for buying, selling,	and brokering quality used stage lighting equipment. The site carries technician maintained inventory sold directly	from 4Wall rental stock that includes unparalleled warranties and customer service. Click here to view this product on UsedLighting.com! Thinking of purchasing rather than renting? NewLighting.com is a division of 4Wall Entertainment that carries brand new,	unopened fixtures and accessories from top manufacturers. You can rest assured that purchases from the site include all	applicable manufacturer warranties, as well as the full customer service and support of the 4Wall family of companies. Click here to view this product on NewLighting.com!